There can't be many albums that can make this claim: recorded in Levon Helm's Woodstock studio and in Hurley, NY, but mixed in Enniskillen. 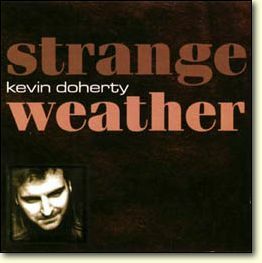 Kevin Doherty's album fits the bill. Strange Weather is the solo debut from the former Four Men & A Dog member. There's not a hint of the traditional sound that characterised that band; here the music and lyrics are infused with influences that are primarily American. It's a darned fine album, and Doherty has crafted a handful of great songs. Dylan is an obvious musical and lyrical influence, and the album has that same easy grace as New Morning. His voice reminds me in places of John Cale or David McComb (the late lamented singer with The Triffids) or even Robert Forster: deadpan, but effective. The playing is top notch too. Doherty sings, plays guitar and a bit of harmonica. And he looks not a million miles from the way Dylan did on the Johnny Cash show. The others involved include Gerry O'Connor, Aaron Hurwitz, Randy Ciarlante, Mike Dunn, Scott Petito, Barry Sless, Marie Spinosa and Amy Helm. Levon Helm shows up on a couple of tracks, and Rick Danko appears on another. (The "new" Band and Four Men & A Dog had toured and recorded together over the past few years.) The album was produced by Hurwitz. Worth seeking out. And keep an eye open for shows in the near future. Levon Helm plays drums on the songs "Need For You" and "I'm On My Way", Rick Danko on bass on "Mary J." The album is available from Woodstock Records, who also have the latest albums from Rick Danko and Levon Helm. Kevin Doherty and the band Four Men and A Dog have close Band connections. Rick Danko opened for them in 1995 in England. They opened for The Band in England and Ireland in 1996, joining them for the encores. The Band and their collaborators were involved in both Four Men and A Dog albums, Dr As Secret Remedies and Long Roads . 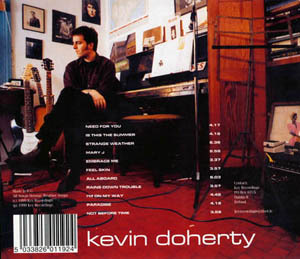 Kevin Doherty wrote the wonderful song "Don't Wait", and also did backing vocals, on the Band's 1998 album Jubilation.